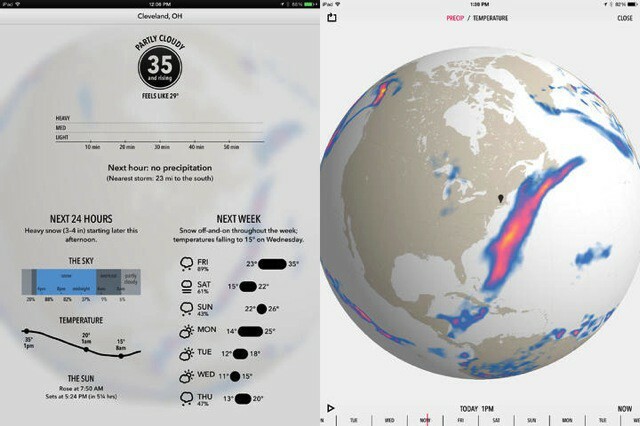 Dark Sky, the Instapaper of weather apps, just hit v4.0. It’s still only available in the U.S and the UK, and it still gives you accurate, hyper-local predictions for rain, but just about everything else has changed. For the better, I might add. When I lived in Barcelona, Spain, I almost never looked at a weather forecast other than in April (showers) or September (ditto). The rest of the time you’d just expect sun. Now I live in Germany, though, I’m back in a country with actual weather, and I check the forecast multiple times an hour. And Dark Sky 4 looks like a great way to check it. The new version has a completely revamped interface, and is now a full-featured weather app, not just a rain-warning app. If you’ve ever used the same developer’s Forecast.io web app, you’ll know what to expect: fluid graphs, clearly-presented info and a glanceable (I just verbed that) interface. It also tells you whether it’s getting hotter or colder, and how far away the nearest storm is. You also get great new maps. The old super-smooth rain radar is still there, but now you get a temperature layer (which works anywhere, not just in the U.S and UK), and you can watch the weather unfold up to a week in the future, all on a spinnable globe. It’s pretty rad. It’s just a shame that the app isn’t available in international app stores because, even though the hyper-local predictions won’t work, the rest of the app will. Then again, the Forecast.io web app works just fine, and can be launched as a web app from the home screen. Dark Sky 4 is a free update and costs $4 for new users.